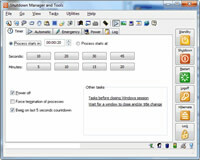 Shutdown Manager and Tools Advantages? - Power Monitor, ideal for Desktop with battery backups and Notebooks. - Clipboard Viewer: view your clipboards content, save images to BMP, JPG, GIF formats with several options, saves text content to file, send text content to keyboard to emulate keystrokes (i.e. : saves time when have to enter long codes, etc.). Easy access at any time with Win+C combination (Windows Start Key and C letter). - Copy IP's to clipboard. - Disable Windows Start Menu. - Disable Windows Task Bar. - Keyboard enabler/disabler: allows you to disable/enable Windows Start Key, Windows Context Menu Key, Control+Esc key combination, Windows Explorer's keys combinations (example: Win+E). - Animate Windows Start Button. - Time Server, with standard NTP protocol, allows to synchronize your entire network computers (Home or Business) to a single computer using any Time Synchronization Tool, like Atomic clock of Comparator Fast. - Tray Icons to Open CDs: keep all your CDs! With a simple click on your CD's icon on system tray, open it in Explorer, right-click to select other options like open in MS-DOS prompt, Eject, launch Properties dialog, copy serial number/volume name to clipboard. Also can process all your CD drives at once (even virtual CDs). - Query Recycle Bin: easy view of space consumed by Recycle Bin, click for details by Drive. Just one click to empty. - Screen saver Utility: disable temporary your screen saver (no need to enter Display Control Panel), activate screen saver immediately, setup screen saver to be activated in seconds (not just minutes). - Complete and detailed Server log, debug mode capable.